Are you feeding the other cats in the area? Ours get a tablespoon of canned food a day as a treat (it's also to curb barfing, which they almost never do) but dry food is what they eat most of the time. It's easier and less waste. I feed the marina cats on Saturday and Sunday nights (the office ladies usually feed them the other nights of the week). People have been contributing food to feed them. All the kitties I ever had love Fancy Feast and it stank. I let them have it though because they get what they want. I love Simon. He's the best cat ever. You don't have to feed him, clean out the litter box or many other things. Trust me, they adore the smell of the canned stuff. 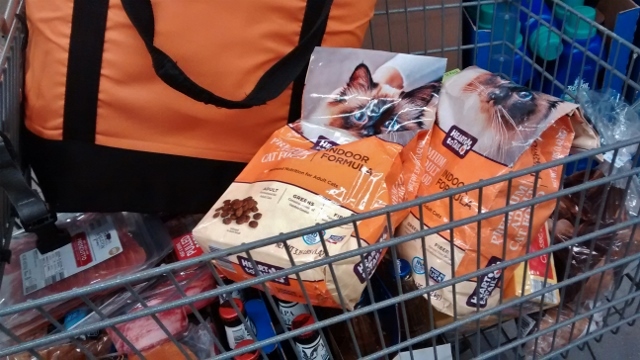 The picture reminds me of how much food i have tobuy for my own cats. But wouldn't they enjoy canned food that smells better? Because you're an ol' softie. We have our own cats, but we also feed a number of neighborhood cats who like to hand in our yard. (Because we FEED them... DUH!) For a number of years, my brother was taking care of stray cats. Fed them, provided water, took them to the vets for their shots and to get neutered, worried about them when he came to visit us. I kept telling him, he "had cats." Well, he moved from Texas to Mississippi, and he took four of those cats with him. Turned them into indoor cats... and yep, now he definitely "has cats." Our girls love the stinky canned food. My husband feeds them some four times a day, the nut. The dry food is better for their teeth. ~sigh~ At least Jezebel still seems to like the dry kibble, and Tilly nibbles it on occasion. Be well!